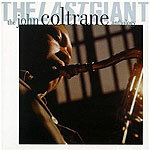 CD review: "The Last Giant"
The first in a line of two-CD retrospectives drawn from Atlantic's vast collection of classic jazz, this Rhino releases traces saxophonist John Coltrane's career from his very earliest days with Dizzy Gillespie in the late '40s and early '50s through his period with Miles Davis in the mid- to late '50s to his most influential solo period in the early '60s. All the great cuts are here, from "Trinkle Tinkle" with Thelonious Monk to "Giant Steps" and studio and live versions of "My Favorite Things." There are also some previously unreleased tracks, including a jam session with some fellow Navy musicians in 1946. It's hard to describe just what a classy release this is, from the cloth-bound two-CD folio to the poetic yet informative booklet to the quality of the sound recording. There are notes from veteran jazz critic Ira Gitler, and a short essay by Ed Bradley of "60 Minutes." This is just a top-quality package from top to bottom, reasonably priced and, if not a comprehensive collection of Coltrane's musical legacy, the best introduction to his music and history for which one could ask.